Take advantage of our clearance section of our website. These are really great items at really great clearance prices! If you see anything you like, give us a call and reserve the item today, we usually ship same day and if you are local, WILL CALL pick up, and DELIVERY is also available! We have clearance items in every category that we have in our store! Take the bake ware section in our store for example. We have over 300 items in this category, there are at least 5 items that we are blowing out to make room for newer stock or even brand new items. Standard also has a large selection of factory seconds, scratch and dents, and refurbished items! We’re not talking about used restaurant equipment, we are talking about restaurant small-wares! We know how it is for a lot of restaurant owners in today’s industry. Restaurant supplies has now become a weekly bill and you have to incorporate all these expenses into your bottom line. Team up with Standard and we will help you succeed by getting you your supplies at a lower price than you could get anywhere else because we have these really special items available. Some of our factory seconds are not even really different than the firsts, maybe a scuff here or there, doesn’t change the application of the item. Ask us. We’re here to help you! Here are some of the clearance items we have available now. Or call us and we can take your order over the phone! 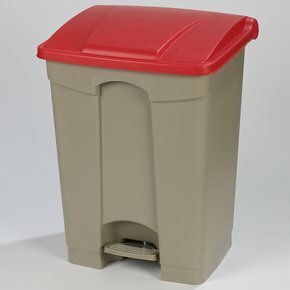 This is a Carlisle 34614505 red lid, step-on, garbage can. This can be used as an indoor or outdoor garbage can. These plastic garbage cans are ideal in environments or work areas where hands free waste collection is mandated or the preferred method. Carlisle has made waste management easy by having color coded lids for HACCP programs or any other color coded programs, like recycling, bio hazard, etc. These sturdy garbage cans are brand new, in the box. All Clearance Corner items are non refundable, all sales final. This is a Carlisle 34614509 green lid, step-on, garbage can. This can be used as an indoor or outdoor garbage can. These plastic garbage cans are ideal in environments or work areas where hands free waste collection is mandated or the preferred method. Carlisle has made waste management easy by having color coded lids for HACCP programs or any other color coded programs, like recycling, bio hazard, etc. These sturdy garbage cans are brand new, in the box. All Clearance Corner items are non refundable, all sales final. 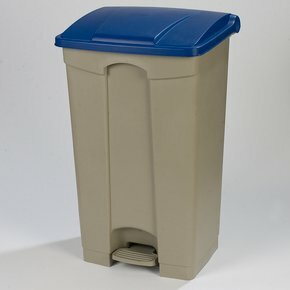 This is a Carlisle 34614505 blue lid, step-on, garbage can. This can be used as an indoor or outdoor garbage can. These plastic garbage cans are ideal in environments or work areas where hands free waste collection is mandated or the preferred method. Carlisle has made waste management easy by having color coded lids for HACCP programs or any other color coded programs, like recycling, bio hazard, etc. These sturdy garbage cans are brand new, in the box. All Clearance Corner items are non refundable, all sales final. Our company is huge, we do a lot of business with a lot of big time players in today’s industry. Sometimes some of these big guys require us to stock one particular item in our warehouse so it is ready for them when they need it. The problem is that if they all of sudden decide they don’t need that item anymore, we are stuck with a whole pallet of them in our warehouse. We have lowered some of the prices down to even below our cost to make more room in our warehouse. Be sure and take advantage of these items today! Keep your cash and change separate and accurate with Carlisle 140101 plastic money maid clip on money tray. 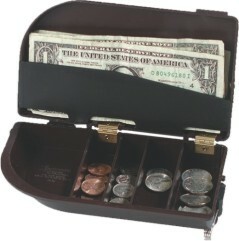 This tray has a locking cash and change compartment that has coin slots and a cash compartment. It is compact and light weight enough to carry with you as you provide your services to your customers. This tray comes with a round clip on for convenience. Clip it to your tray, apron, or whatever works! Carlisle?s 140101 money maid clip on tray also has a compartment for a napkin that you can carry with you! Its perfect for waitresses, peddlers in carnivals, or peddlers in residential neighborhoods! Order Carlisles 140101 money maid clip on tray from Standard Restaurant Supply where you?ll find the best ideas, products, and prices for food service equipment and restaurant supplies available online! The Tablecraft 405B ashtray is not your typical ash tray. The 405B features 6 medium sized grooves to hold cigarettes and one large groove to hold cigars. Like most ash trays in today’s market, it is 5 inches in diameter, and is 1 inch deep. This ashtray is very affordable and will hold up to constant use. 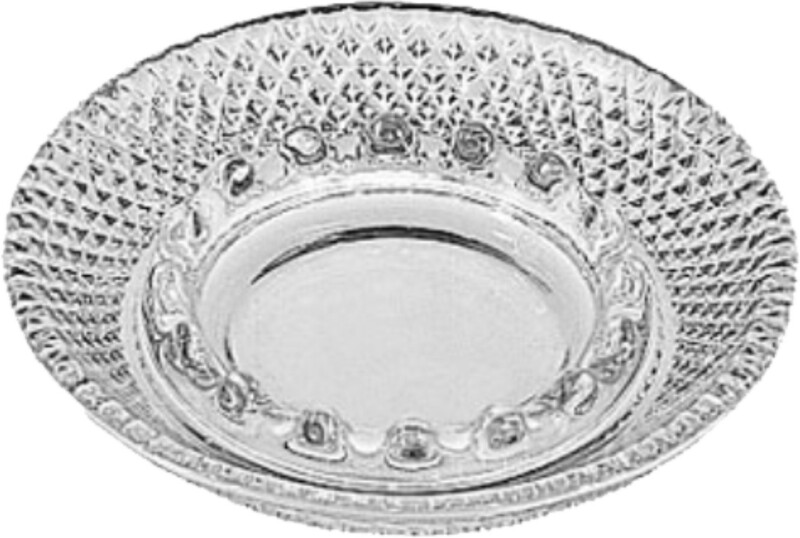 If your customer’s smoke, why not add a touch of class to the table with Anchor Hocking glassware? These Anchor Hocking 35U Sure snuff clear glass ashtrays are guaranteed to please the eye, and their usability can’t be beat. 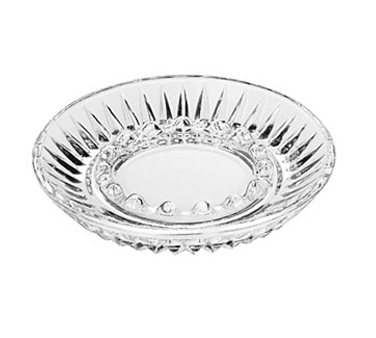 Placing a glass ash tray on your table shows a commitment to meeting the needs of your customers in style. Making that glassware an Anchor Hocking product shows your common sense. Come to Standard Restaurant Supply for quality, save on price. 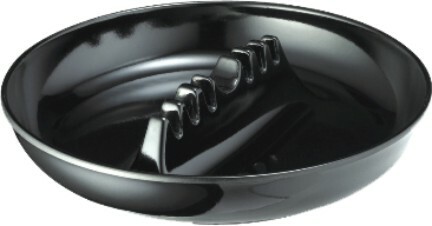 If you or your guests smoke, you will enjoy this wonderfully crafted and stackable Libbey 5265 Safety Ashtray. Like a cigar, it has a smooth design, and comes with a winchester style to give you added protection from hot ash. Perfect for countertops, bars & restaurant tables.